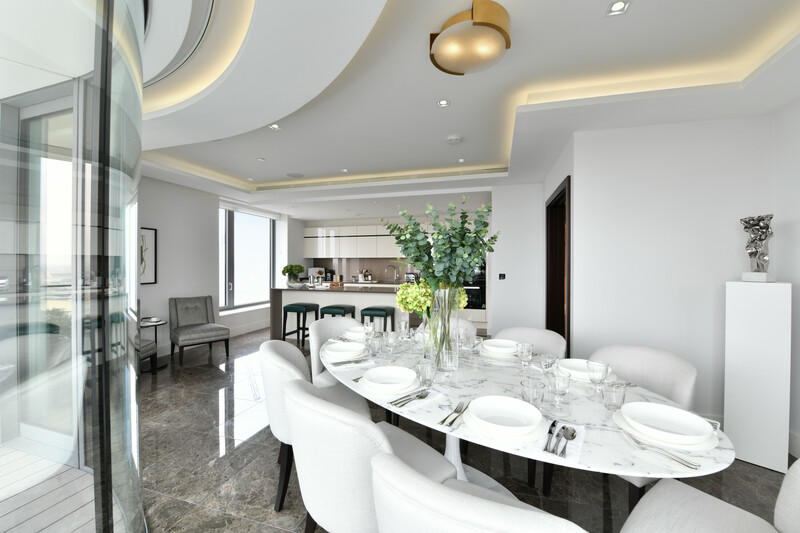 We visit the Corniche, one of three luxury developments that make up the new Albert Embankment Plaza, to find out more about the development and visit its award-winning show apartment. Gazing out over the river Thames near Vauxhall, south London, three high-rise buildings sit in various stages of completion. They are nestled on the Albert Embankment; the smallest of the high-rises, Merano, is the only one finished, housing office workers and apartment-dwelling residents alike. The middle building, the Dumont, is currently a building site – it’s not due for completion until 2020. The largest and most extravagant of the buildings, however, is the last: the Corniche. Designed by internationally acclaimed architectural practice Foster + Partners, the Corniche is a luxury residential development made up of 168 apartments, ranging from studios up to four-bedroom penthouses. Together, Merano, the Dumont, and the Corniche developments make up the Albert Embankment Plaza, a new offering of luxury developments by St James. 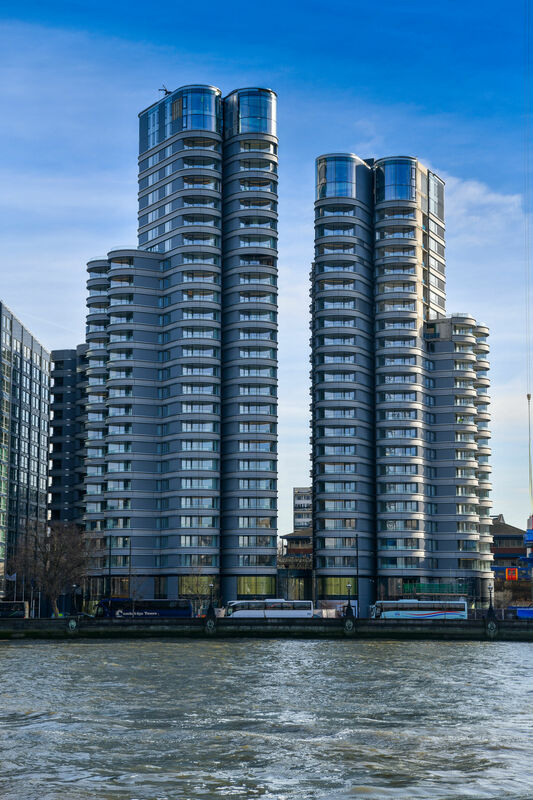 All three developments have been designed by acclaimed creative studios; Merano boasts Rogers Stirk Harbour + Partners as its architect, whilst the Dumont was created by David Walker Architects. Each building has its own unique style, but it could be argued that the Corniche takes this one step further. Beautifully curved, and angled to receive some of the best views of London, the Corniche echoes the river below and pays homage to the stern of a boat. 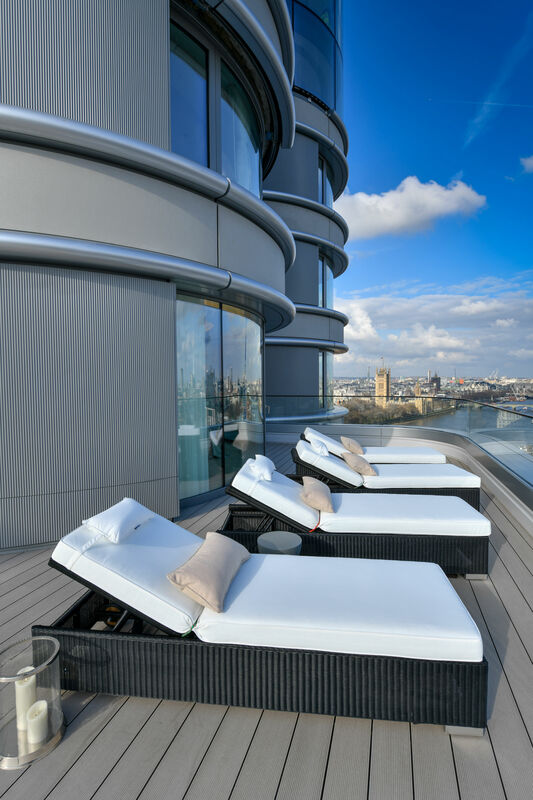 Each of the balconies lies on these curves, offering panoramic views of the River Thames and London’s unique skyline. 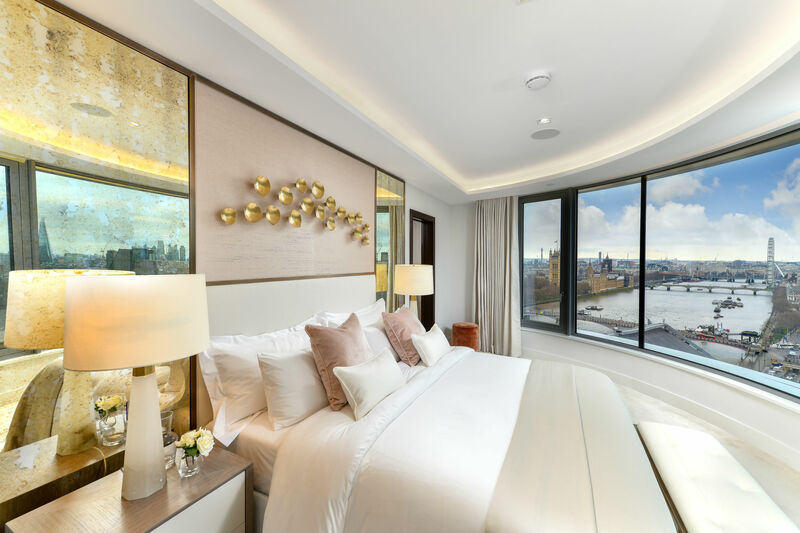 With three separate developments at their disposal, St James is offering residents of the Albert Embankment Plaza a range of 5-star luxury facilities. Within the Corniche, residents will have access to a pool, Jacuzzi, sauna, spa, steam room, different treatment rooms, and a resident’s club lounge with a stunning roof terrace. In parallel, the Dumont will host a private cinema, ten pin bowling lane, games room and another resident’s lounge. In the Dumont, residents will also have access to a private dining room – with its own kitchen – and a breakout cocktail space with a balcony; both of these spaces can be hired out for residents who wish to entertain guests away from their homes. The three complementary developments hope to create an open, lifestyle-centric hub, offering residents everything they could need – including central London on their doorstep. 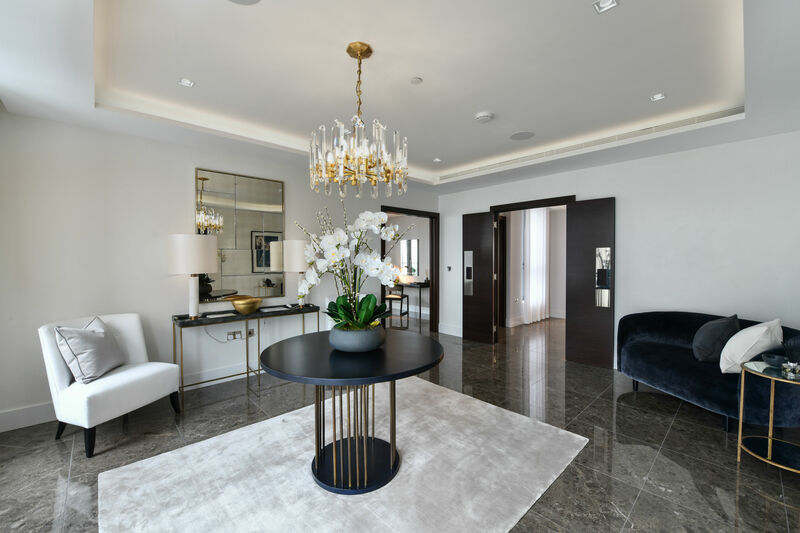 Intrigued by these new developments, and what the Plaza trio could bring to the Albert Embankment, DesignCurial visited the Corniche and took a tour of its three-bedroom show apartment - which was recently crowned the winner of the Evening Standard’s Best Luxury Home category at their 2018 New Homes Awards. Emily Williams, the co-founder of luxury interior design studio BradyWilliams (who created the show apartment’s stunning interiors), showed us around the space she helped create. “[Also], because we were dealing with this massive, panoramic view, we had that very much in mind when we tried to pick the various furnishings. We focused a lot on reflection because of the views – virtually in every room, we’ve covered it somehow.” Williams leads us through a large, open entrance lobby; the BradyWilliams team have added polished plaster to the walls of the space, which reflect the light with a subtle shine. Just outside the kitchen, a second, smaller entry into the apartment has still been dressed by BradyWilliams, as Williams explains it is more likely to be the apartment’s “day to day” entry. This is also the entryway that lies closest to the show apartment’s three bedrooms. As the apartment had three different spaces, it gave room for BradyWilliams to create three individual designs: one feminine, one masculine and one neutral bedroom. All three rooms feature bespoke elements and their own bathrooms. Discussing the ‘feminine’ bedroom, Williams says, “We had a curved room to contend with, but we wanted to make it about the view – we wanted it to fee very light, fresh and feminine but not girly.” Acting against the huge view that looks north over the river Thames, the ‘feminine’ bedroom includes a bespoke dressing table which mirrors the room’s architecture, as well as an artistic headboard featuring gold leaf-shaped embellishments and a pink, blush and cream colour scheme. By November 2018, the Corniche is set to be completely finished, with all residents moved in. What does this mean for BradyWilliams’ show apartment? Not much – it found a buyer only three weeks after the interiors were completed. It’s a testament to BradyWilliams’ remarkable interior design, proving they are well versed in creating luxurious spaces. As for the development itself, the Corniche only has a few apartments left to be sold; and with the Dumont’s completion only a few years away, Albert Embankment Plaza might become a new, thriving hub sooner than expected.